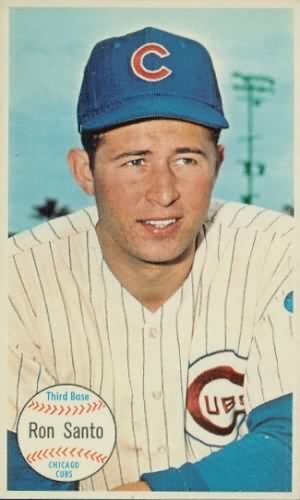 Several weeks ago the Veterans Committee of the National Baseball Hall of Fame announced that Ron Santo, the click-of-the-heels, laser-throwing, and clutch-hitting third baseman for the vintage Chicago Cubs (1960–70) had been inducted. This announcement came nearly a year to the day of Santo’s death. Chicago papers reported that Billy Williams, the outfielder who played with Santo (and who, along with Ferguson Jenkins and Ernie Banks, constituted three of the four players from that Cubs team in, or to-be-in, Cooperstown) called Santo’s wife, Vicki, to give her the good news. Some wish that this had occurred earlier while Santo was still alive to savor the trip to the shore of Lake Otsego and the induction into the Leatherstocking village of James Fenimore Cooper. Rather than go down that road, let’s be glad that this has occurred. The Powers-of-the-Hall have affirmed what kids who played baseball in Chicago parks or took the Ravenswood el to Belmont for the quick hop north to Addison Street and Wrigley Field always knew: Aside the spectral Bill James-style sabermetric stats, Ron Santo was a genuine baseball hero. I (William van Ornum) was eleven-years old and in seventh grade when my friend Wayne and I rode our Schwinn wide-tube bikes along a road next to the Chicago and Northwestern tracks to Santo’s house in Park Ridge. (Wayne had a friend who gave him the address.) I approached hesitantly, like a bunt dribbling down the third base line. Santo emerged from his ranch house, welcomed Wayne and me into his driveway, and signed my friend’s mitt and then mine: “To Bill, Best Wishes, Ron Santo.” Along with the Bobby Shantz “autograph” (branded onto the glove by the manufacturer) was Ron’s. It took a few years for the ink to wear off as I snagged many ground balls and maybe even a line drive or two. I’ve since lost the glove, but the fond memories remain. I hope I’ll run into Cubs fans from the past on July 22, 2012, when Santo is enshrined. About a year ago, just after his death, I wrote a fond remembrance of Santo for America. This entry was posted in Baseball and tagged Bill James, Billy Williams, Bobby Shantz, Chicago Cubs, Ernie Banks, Ferguson Jenkins, Literature, National Baseball Hall of Fame, Ron Santo, Wrigley Field. Bookmark the permalink.